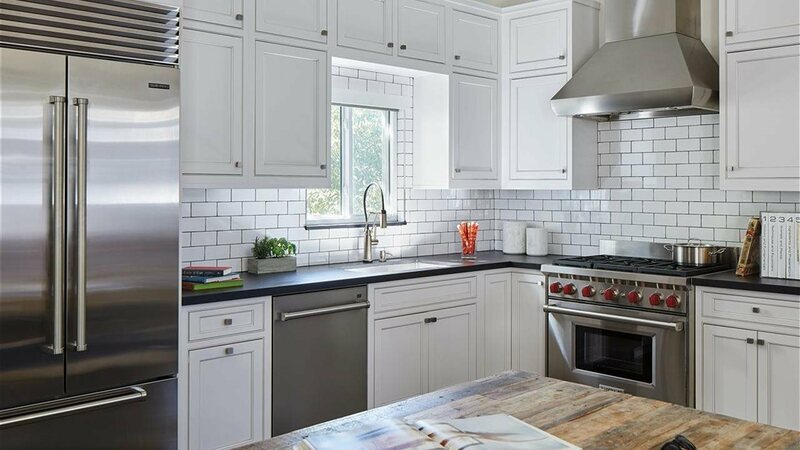 When award-winning chef and culinary visionary Michael Voltaggio was remodeling his West Hollywood home, he purposefully selected kitchen essentials that facilitate restaurant-level culinary innovation in a residential setting. Chef Voltaggio’s home kitchen couples superior functionality with style, integrating handpicked fixtures and tools of the trade necessary to establish an environment that inspires an elevated culinary process. One of the most important lessons a chef learns is the concept of mise en place — French for “everything in its place” — to streamline organization and enable efficiency. With expert forethought and understanding of the importance of countertops as a prep canvas, Michael incorporated creative cabinetry and storage solutions into his home kitchen, creating a clean, structured environment. To maximize space, he used his favored methods, such as a vacuum pack machine to clear freezer space, and stackable containers to organize ingredients and increase efficiency. 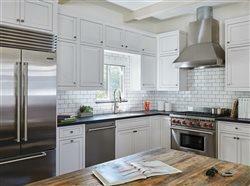 Infusing versatility wherever possible is also key to a high-functioning kitchen. Michael incorporated a rolling cutting board island to provide more prep space when needed, and to be used as a serving station while entertaining. Seamless integration of carefully selected everyday essentials will ensure an at-home chef is set up for success in the kitchen. Michael's personal kitchen is no exception, being fully equipped with must-have tools such as a customized knife set made to ensure comfort and secure handling, an immersion circulator for commercial-style sous vide cooking, and a Japanese mandoline to slice consistently sized portions for a professional meal aesthetic. Each tool should serve a purpose, enhancing individual technique and empowering the user to cook at restaurant-level quality. As an anchor fixture in the culinary process, the faucet serves as a key essential for function and design in Michael’s kitchen. The Solna Articulating Kitchen Faucet with SmartTouch Technology by Brizo is inspired by a sleek, Scandinavian aesthetic, bringing crisp lines and beautiful simplicity into any kitchen. Akin to the industrial feel of a commercial kitchen, the faucet’s design offers a full range of motion, a magnetic docking system and innovative touch technology that allows simple water activation ideal for fast-paced kitchen environments. Merge functionality of this caliber with sleek design elements to create a contemporary, commercial-inspired setting in the comfort of a residential kitchen space. Maintaining a source of creative inspiration will ensure at-home cooks are constantly evolving and refining their culinary skills. A must-have essential for Michael is the ever-present stack of cookbooks, offering new and unexplored recipes of classical chefs and contemporaries alike. A dedicated place to take notes also enhances a chef’s ability to ideate while experimenting in the kitchen. Build in space for a chalkboard or whiteboard to plan and curate recipes, enabling real-time improvisation and setting a foundation for restaurant-worthy culinary creativity.